Ashby Croquet Club is located 3 miles to the west of Ashby-de-la-Zouch in Leicestershire, right in the heart of the National Forest. We are based within the sports ground at Moira Miners’ Welfare Sports & Social Club, Bath Lane, Moira, Swadlincote DE12 6BP. Moira Miners’ Welfare Club is opposite the Conkers Waterside entrance on Bath Lane, Moira. Go through the green gates next to the war memorial. 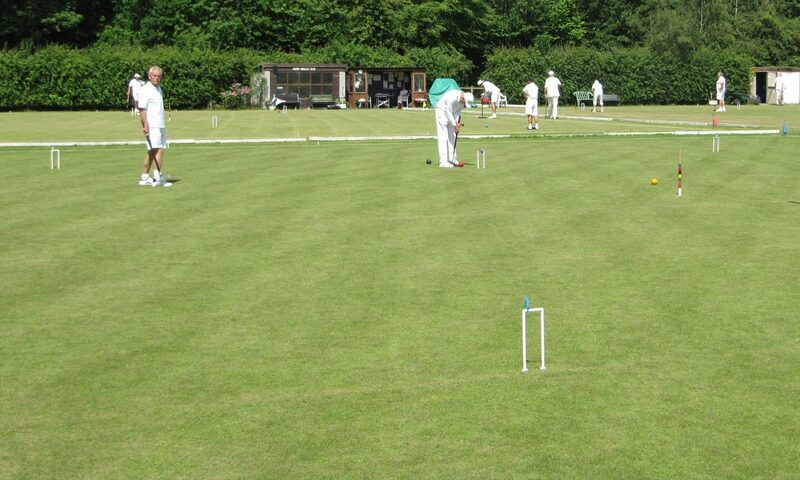 As you drive in, the croquet lawns are on the right hand side of the car park. From Ashby: At the bottom end of the main street, go straight on at the double mini-roundabout towards Moira. Follow this road for 3 miles. At the Moira Toll Gate double mini-roundabout continue straight on, then after 400 yards follow the road round to the right (in the direction of Overseal). Moira Miners Welfare is 300 yards on the left, through the green gates immediately after the war memorial. From the north-west: From Burton-upon-Trent take the A444 (signposted Nuneaton). After 5 miles you reach the village of Overseal. Take the second main left turn here (signposted Moira). Follow this road for 1 mile, and Moira Miners Welfare is on the right (opposite Conkers Waterside entrance) through the green gates immediately before the war memorial. From the north-east: M1 southwards to Junction 23A, joining the A42. Leave the A42 at the first available exit (Junction 13). At the roundabout turn right for the A511 Ashby/Burton, then at the next roundabout turn left for Ashby town centre, then follow the “From Ashby” directions above. From the south-west: Leave the M42 at Junction 11; at the roundabout take the 2nd exit on to the A444 (Burton direction). After 3 miles you reach the village of Overseal. Take the first right (just after the speed camera) signposted Moira. Follow this road for 1 mile, and Moira Miners Welfare is on the right (opposite Conkers Waterside entrance) through the green gates immediately before the war memorial. From the south-east: M1 northwards to Junction 22; at the roundabout take the 2nd exit on to the A511 to Ashby. Follow the signs to Ashby town centre, then follow the “From Ashby” directions above. The nearest station is Burton-on-Trent (8 miles from the club). Unfortunately Moira is now a public transport desert, but here are the details of the nearest bus routes which all involve a walk. Midland Classic 19 (Burton – Swadlincote – Ashby) stops at Overseal (Burton Road/Lullington Road, 1.25 miles from the club), hourly. Arriva 29 (Burton – Swadlincote – Ashby) stops at Norris Hill (1.5 miles from the club), hourly. Midland Classic 21E (Burton – Swadlincote – Overseal) stops at Overseal (Moira Road/Hallcroft Avenue, 0.75 mile from the club), approx. hourly. Midland Classic 21E (Burton – Swadlincote – Overseal) stops at Overseal (Moira Road/Hallcroft Avenue, 0.75 mile from the club), approx. hourly until about 5pm.